Glee: Evangelist For Sexual Immorality? NewsBusters’ Brent Bozell whines that Glee is ruining the world, and turning your kids gay, parents of America – in a new column for CNSNews.com. Just to get it out of the way, NewsBusters’ mission statement is “Exposing & Combating Liberal Media Bias”, which is to say, there’s about to be some eye-rolling here. They are not celebrating diversity. They are intimidating dissidents. Riiight. There was no plan to debate gay teens, because there is no debate to be had. There are millions of gay teens in the world, and now they are being represented on the television shows that want their viewership. This is encouraged, obviously, because it is more representative of the world we actually live in, rather than a make-believe world where adult gay men pluck children from their sleep and brainwash them with the gay agenda. Let’s call a spade a spade, Bozell. 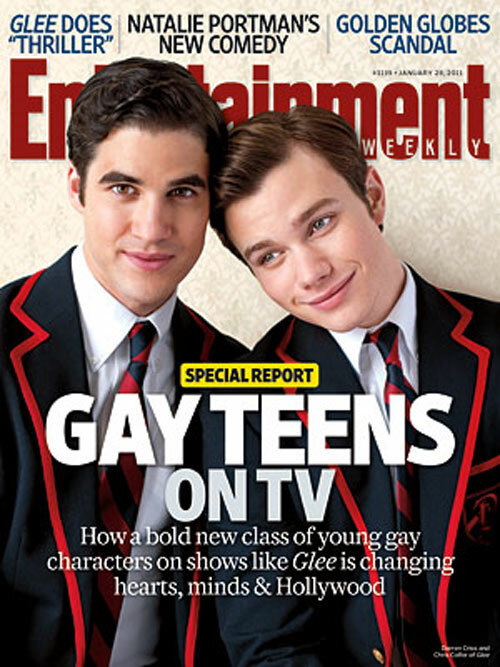 You’re obsessing over two boys touching heads on a magazine cover about a television show. Sounds pretty gay to me. What do you think about Bozell’s hissy fit about Golden Globe winner Chris Colfer’s Entertainment Weekly cover?